PALMER — From a one-car garage in a tiny triplex, Holly Christensen helps run a worldwide wig-making nonprofit that tries to lift the spirits of kids with cancer. The Magic Yarn Project has gotten so big it's bumping up against practical concerns like time and money. Since Christensen and partner Bree Hitchcock founded the small nonprofit in 2015, nearly 6,000 yarn wigs have made it to children who lost their hair to chemotherapy throughout the United States and in 34 countries. 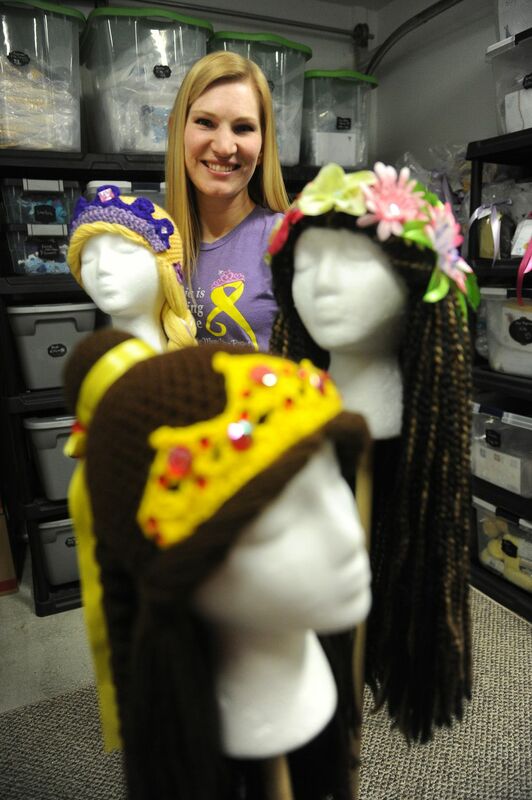 Fashioned by thousands of volunteers, the wigs start with soft crocheted beanies gentle on scalps that chemo made raw. The beanies form the base for yarn hair styled into Disney superstar princess hair — Elsa, Anna, Moana, Ariel, Tiara, Rapunzel — but also Jack Sparrow pirates and superheros. Now the nonprofit that started out with one wig for a friend's sick daughter is the focus of a national video produced by State Farm Insurance through its Neighborhood of Good series. The video was released in late January. It's received nearly 3,800 views on YouTube. The crew surprised Christensen at Mat-Su Regional Medical Center in November with the rare chance to meet the child who got her first wig: a friend's daughter, Lily, now 5, in remission, and living in Missouri. The video shows her friend, Rachel Mecham, thanking Christensen for all the help she's given others since that first Rapunzel wig for Lily. "When she was going through cancer we had to spend a lot of nights in the hospital," Mecham says on the video, her voice breaking. "And it's really hard to be alone and away from all her friends and family. And your wig was just one of those tender mercies I felt like were really inspired, and you're really helping a ton of people." Christensen, a 33-year-old nurse with three young children, says she never expected the project to get so big — or so challenging. After that first Rapunzel wig in 2015, and help from church friends making more, a Facebook request for yarn donations went viral. Forty people turned up at a Palmer wig-making workshop. Gofundme featured the wigs. 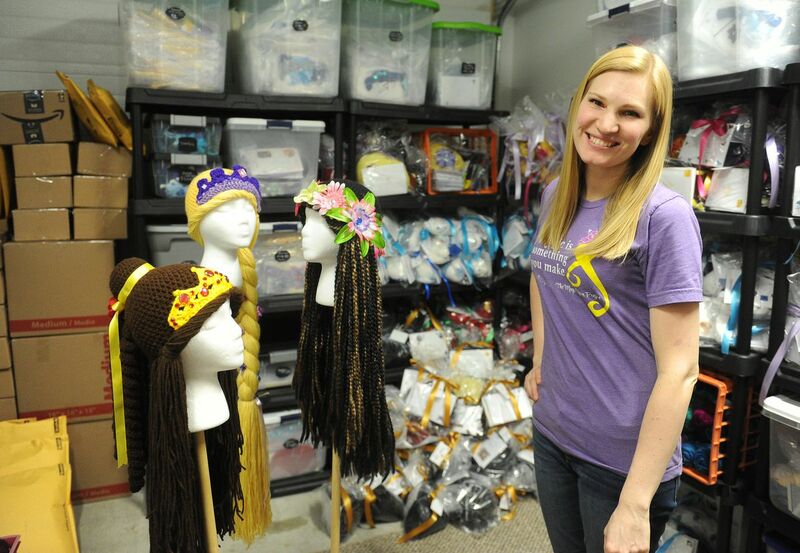 The project now relies on hundreds of volunteers around the country who work on the wigs and send them back to Alaska for shipment to young cancer patients. People turn out at workshops to help. Christensen hosted one at her alma mater, Brigham Young University, earlier this year. "It wouldn't happen without the help of all the people," she said Friday. "It's so many other people who have done so much." Still, the wig project has grown so much that Christensen's duties coordinating everything take as much time as a full-time job, she said. She's down to working one day a week at a Wasilla orthopedic surgery practice. Finding funding can be difficult. The Magic Yarn organization is a federally recognized nonprofit but so small it's hard to get grants, Christensen said. Sitting in her kitchen on a cold February morning with her 3-year-old son occupied momentarily and her 6- and 8-year-old daughters at school, Christensen wondered about the future. She and her chiropractor husband, Garrett, are building a new house out-of-pocket on family farmland up Palmer-Fishhook Road this summer. They can't afford contractors, she said. She's losing the Magic Yarn workshop in the move and is trying to find money or volunteer labor to build some kind of shed. The wigs occupy time that could be spent getting her kids to play dates or activities. All those lost work hours could have gone toward a bigger home by now. But Christensen knows the wigs matter. She can see it in the photographs hanging in the workshop: mostly little girls, big eyes and proud faces, their hairless heads covered with colorful yarn braids. One models her Ariel wig with a feeding tube in her nose and chemo port over her heart. Christensen, who worked with Stage 4 cancer patients at a Texas hospital, touches each photo she describes: "She's in remission. She's finishing up treatment now. She passed away." She also sees the effect her calling has on her own children. They say blessings to "the kids with cancer" when they say their prayers at night. "I guess I'd rather be in this tiny apartment and know they're learning about serving others than be in a big house and not have this experience," Christensen said.